You are awesome, Internet! Yesterday, during my interview with Damon O'Steen, I mentioned that I thought his female lead, Davis Neves, is really cute. As it turns out, my friend Kyle (oh, you remember Kyle - he's guest blogged on a few movies with me this month) also directed her in a sketch show at the Improv Olympic. He told her to come check out my blog, and she not only left a comment, but we're also friends on Facebook now. That took one day! Do you know what this means, Internet? It means that Fred Schneider is totally going to call me for my birthday! Pontypool is one of my favorite kinds of viewing experiences, the completely unexpected surprise. I was scanning an online discussion about titles that people wished would become available on Netflix, and somebody mentioned this movie. It was released in 2009, and has been on DVD for a while, but it's never been made available on Netflix. When I was trying to think of movies to add to the lineup for Return of Project Horror, I remembered this one and saw that it was still unavailable, but had the idea to search the upcoming listings on TV. Success! It was airing at two in the morning on one of the movie channels, so I set it to record, and it's been sitting on my DVR for nearly two months, just waiting for me to watch it. After watching it tonight I think it may end up being this year's standout recommendation, just like BubbaHo-Tep was last year. I found it to be a really unique movie, both in terms of plot and execution. Stephen McHattie plays morning radio personality Grant Mazzy, who has been fired from two previous stations for shock jock antics, and is now stuck in the small town of Pontypool, Ontario, giving boring news updates and trying to find a job at a station with the kind of audience that he once had. As the morning progresses, the station crew receives reports of strange and increasingly violent behavior in town, but they're unable to get clear information about its cause or outcome until the town doctor shows up at the station and begs to be let in. He is able to share his theory about what is happening: the town has been struck by a virus that spreads itself not through air or by touch, but through language. Certain words or patterns of speech cause the brain of the person who hears them to reprogram itself, and they become violently obsessed with spreading the virus to others. As more and more of the town becomes infected, the sick begin to close in on the sole remaining source of untainted voices: the radio station. With the exception of this movie's opening scene, and one or two others, the entirety of the plot occurs in just one room, the broadcasting booth. Except for a couple of scenes of violence, almost all of the action actually occurs offscreen, and is relayed to our characters through phone calls or TV broadcasts. You would think that this would make for a really uninteresting movie, but it works perfectly. You don't know any more than the people in this small room do, so you share in their confusion and isolation. When the infected begin to lay siege to the station, you share in their panic and claustrophobia. The character of Grant Mazzy is nicely developed through the course of the movie. As the strange events of Pontypool begin to be reported to outside media, you can see the gleam in his eye as he anticipates using his role as the man-on-the-ground to begin his climb back into a better job. The relationship between him and his station engineer (played by McHattie's real-life wife, Lisa Houle) grows progressively more interesting and complex, too. I also thought that the idea of a linguistically-transmitted illness was a very cool one. It reminded me of the Neal Stephenson book Snow Crash. 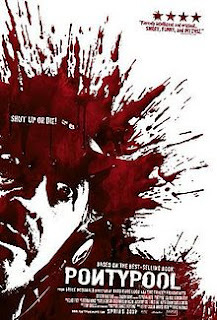 Although there is a little bit of onscreen violence, I think I could still safely recommend this movie to people who are not usually fans of horror movies. I'm actually surprised this one hasn't built a bigger name for itself, because it's honestly one of the most well-executed horror movies I've seen in a long time. I give it five radio microphones out of five. This sounds interesting, I'll have to check it out. From what I've seen of your taste in movies from your blog, I think you'd really like it.